New mosaic dedicated to bread-making! I’m currently working on an exciting new commission for a Bread Maker in France @ La Ferme d’Herteloup. The mosaic has been made off site on wedi boards in UK and will be installed later this month! Ive been collaborating with Paul Bassingthwaighte, who made the ceramics of wheat, birds, butterflies, a Christ figure (head with flowers of thorns), fools (modern gargolyles), and hands. He’s a talented painter and film maker and making ceramics pieces has been a new direction for him too. We’ve had a very creative few months interpretting Nick ‘s ideas (who owns the farm and makes the bread amonst other things) and hope that it represents some of his passions, as well as a few of our own. Materials included stained glass to create a bursting light-filled sun in the centre of the mosaic artwork , gold mirror on the arch of wheat and included colourful shards of Paul’s broken ceramic plates around the white filled background, (It’s all useful stuff and popular in French mosaic style Pique Assiette). 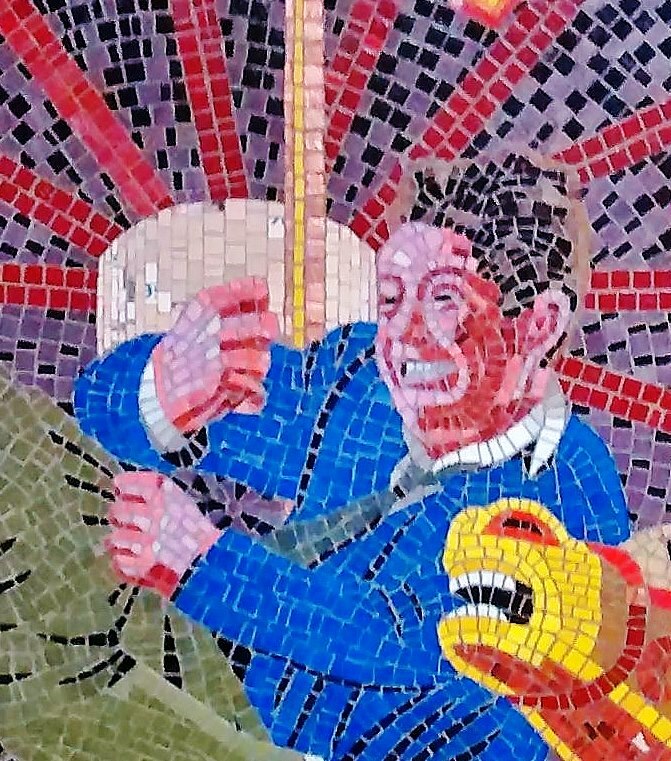 The final addition to the menagerie of creatures scattered around the mosaic was the gecko as something tactile hopefully in reach for Nick’s young son to touch as he grows up. The mosaic itself will be installed around the chimney of a traditional bread making oven. On the lower part of the wall will be the ceramic hands within the larger hand to represent all the people who are receiving the bread and who have ‘had a hand’ in making it. Very excited as about to set off for France to install it. Will post pictures in situ soon… A bientot! Author beetruPosted on August 20, 2018 August 20, 2018 Categories Animal Mosaics, UncategorizedLeave a comment on New mosaic dedicated to bread-making! Thanks to everyone who came to the launch event of the new Mosaic in Willesden Green . The day moved so fast, that after the Mayoress cutting the ribbon, we forgot to say our speeches and to thank everyone involved… so here it is in a blog i suppose. The launch was a joint effort with Willesden Green Town Team‘s Abraham Ryan who prepared over 50 self popping balloons in gorgeous lime and forest green, and a big thx to Ursula for her super cat biscuits (not edible for cats really but us humans), Deborah Mahs for her organisation of fire brigade (adding some uniformed men appeal to the occasion??) , Nick the painter (and part time tattoo artist) , Hannah Milsom for checking on the kids mask making and bringing the step ladder for the Mayoress, Leslie Jones and ….. Welcome two new cats in my life : Eartha, who has taken 6 months to grow to completion, and JB, who arrived in my home a few weeks ago, already 1 years old. Eartha, however, is a mosaic artwork and the second in the ‘Catwalk’ Series inspired by the strange and wonderful anthropomorphic illustrations of Louis Wain. This one is based on a ‘Norwegian Forest’ breed with a big sideways mysterious grin. Gladstone Park Primary School pupils held a ceramucs workshop and made things you’d see in the town – there is the corner shop, traffic lights, litter bins, local mosque, and named tube station roundels, amongst other icons. They also made flora and fauna, bees, butterflies and local birds. Meanwhile, the real character of cats continue to amaze me…JB is a constant now, and i thank Eartha for bringing him into my life. Classes starting from November 2015 at a new venue! COME ALONG TO A MOSAIC WORKSHOP held on the last weekend of each month, held in a bright and airy studio in Islington, North London. POP UP PAINTING & EVENTS are supporting these new sessions – they welcome the opportunity for people to unleash their creativity, have fun in an enjoyable environment and be supported by great tutors! The next MOSAIC workshop is on 28 & 29th November from 10 – 5pm. Author beetruPosted on October 21, 2015 August 21, 2018 Categories UncategorizedLeave a comment on Classes starting from November 2015 at a new venue! Eartha (the Cat) is about to step out ! 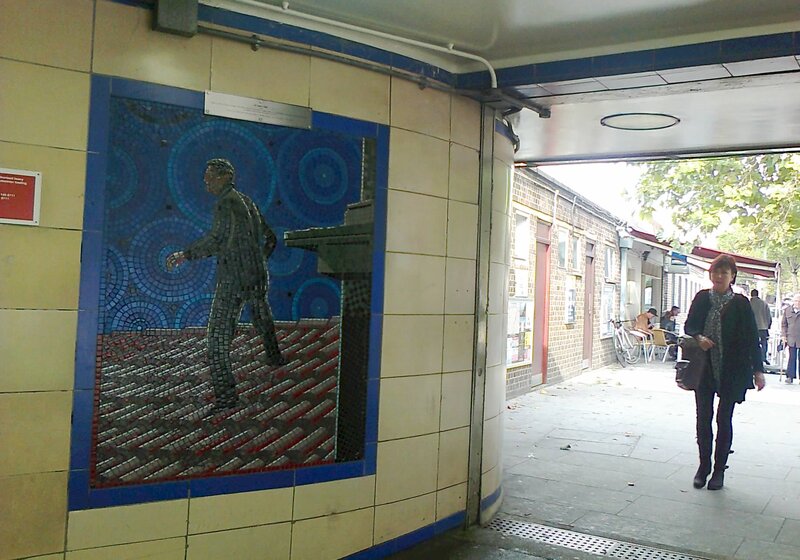 The second mosaic in the CATWALK series commissioned by Willesden Green Town Team, is nearly completed. Hoping she will make it in time for Christmas, where it will be installed on Poplars Avenue, near Sainsburys on Willesden Green High Street. Author beetruPosted on October 21, 2015 August 21, 2018 Format ImageCategories Animal MosaicsLeave a comment on Eartha (the Cat) is about to step out ! After giving them confidence learning some basic techniques by making small coasters with a ‘heart’, they then got straight in to the communal project and added their own touch to the mosaic mural. Dancers, musical instruments etc! The mosaic is based on 1950s record covers of Calypso music, such as this one below. There are some really fascinating record covers out there! Beatrice from Notre Art has been working hard to get word out and attract new members at the Day Centre. Many of the particiipants who have mobility, movement and sight issues and with early to mid stages of dementia have started to feel the benefits of this creative and social activity. The daily dose of domino games and daytime TV has to wait till tomorrow ! Keeping hands and eyes busy proved to be popular – many showed an industrious energy, passion and feeling for the medium that i did not predict. Others who initially showed unsteady hands, catarracts and concentration difficulties made significant progress to the figures’ clothing, carribean fruit motifs and jamaican flowers! Just hoping next week there is another full house to keep the mosaic going. Thanks to Ruth Morrison, the Director, and Russell for their unflinching support so far! ‘SPELLBOUND’- an Alfred Hitchcock mosaic-inspired exclusive! The mosaic itself is incredibly powerful; bright colours in vitreous glass tessarae are used to set off the designs, acid pink, electric blue or spine-chilling citrus yellow. Repetitive shapes/andamento next to details such as faces or hands are contrasted against each other which give the mosaic real impact, just as impressive as the lighting of the films themselves. There’s much more to say, but here are my first impressions – backgrounds of cirles and swirls, outlining, sharp highlights, tonal gradation etc etc – bold shapes and designs. would you stop and look? Author beetruPosted on January 5, 2015 August 21, 2018 Categories UncategorizedLeave a comment on ‘SPELLBOUND’- an Alfred Hitchcock mosaic-inspired exclusive!